This weeks recipe is the perfect summer salad and goes terrific with fish or a BBQ. It is easy as can be and takes all of five minutes to put together! I know you will love this one as much as I do. Cook broad beans and peas separately following packet directions. Drain. Refresh under cold water. Peel broad beans and discard skins. Peel grapefruit and segment (see notes). Squeeze leftover membranes over a bowl to catch the juice (you will need 2 tablespoons juice). Discard membranes. 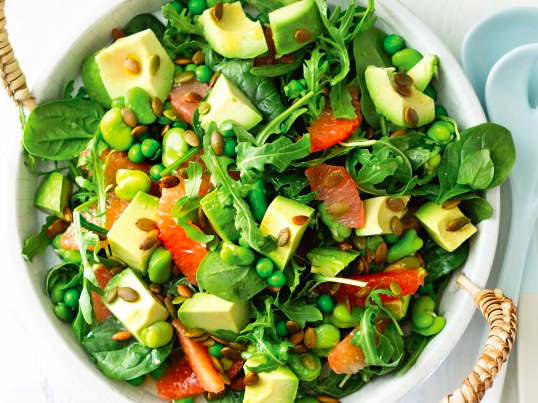 Arrange rocket, spinach, avocado, grapefruit segments, broad beans, peas on a serving plate. Whisk grapefruit juice, oil, mustard and salt and pepper in a small bowl. Drizzle over salad. Sprinkle Pine nuts.